The popular product from HW group, the Ethernet thermometer HWg STE is now available in its second generation. 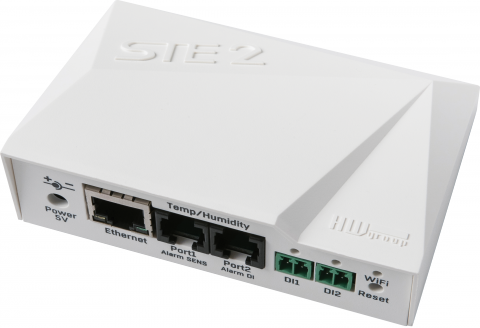 STE2 not only bundles the basic functionality of its smaller siblings HWg STE, HWg STE plus and HWg STE PoE, but also allows sending of encrypted alert notifications and WiFi connectivity. For years the reliable Ethernet thermometers of Czech company HW group have monitored the climate in server rooms, HVAC environments and offices. With HWg STE2, the HW group launched a new stand-of-the-art product. The unit can be powered by the 5V adapter included in delivery or alternatively via Power over Ethernet. HWg STE2 measures up to three parameters over 1-wire probes. A temperature sensors is included in delivery. Additional sensors are available as accessories.